Watch KCTS9 and InvestigateWest’s special report on air pollution in south Seattle, which airs on KCTS 9 Connects, Friday, June 17 at 7 p.m.
Rosa Vela is always on alert, watching for signs her five-year-old daughter, Lettie, is having trouble breathing. She knows the next severe asthma attack could send Lettie to the hospital for yet another round of treatment. Lettie Vela’s family lives in the Duwamish River Valley that lies between Beacon Hill and West Seattle, where rates for hospitalization of children for asthma are the highest in King County. Residents here face an onslaught of toxic airborne pollutants that according to a recent study exceed regulatory caution levels by up to 30 times. According to a second recent study, the Puget Sound region is in the top 5 percent of communities nationally for air toxics. And the industrial neighborhoods of Georgetown and South Park have some of the dirtiest air in the Puget Sound region. Where is this toxic air coming from? The answer may surprise you. The majority of the pollution, government regulators and scientists say, comes not from the large concentration of industrial facilities in South Park and Georgetown. Rather, it’s from the cars, trucks and buses whizzing by these neighborhoods – especially those with diesel engines. Fumes from ships in Elliott Bay and the Duwamish, as well as diesel-powered equipment at the Port of Seattle and elsewhere, add to the toxic mix. In the fall and winter, wood smoke from fireplaces becomes a significant contributor. The problems here have implications in other neighborhoods, too: Anywhere people are living close to major roadways, they’re likely breathing unhealthy air, studies show. Anyone living within about 200 yards of a major roadway is thought to be at increased risk, with the first 100 yards being the hottest pollution zone. That’s the situation the Vela family faces. Two major roadways choked with diesel traffic intersect within a block of the Velas’ home, which is also lo cated near an entrance ramp to Interstate 5. The white-picket fence in front of the Vela home cannot hold back the waves of soot from passing trucks and buses. The soot comes with toxic hitchhikers such as benzene and formaldehyde – toxics that the second recent studyshowed are present at levels that make the air here among the most deadly in the region. And state Ecology Department mapping shows air pollution levels along south Seattle highways are some of the highest in the state, said Matt Kadlec, senior toxicologist at the agency. For people who live in Georgetown and South Park, one of the most visible sources of air pollution is the fleet of privately owned trucks that haul freight from the port to rail yards and other destinations in south Seattle. More than 8,000 port-related truck trips occur on an average weekday, the port estimates, based on Washington Department of Transportation traffic counts. Residents have fixed much of their ire on these cargo-hauling semis. Georgetown Neighborhood Council Chair Holly Krejci said at a meeting called by City Council members Nick Licata and Mike O’Brien. Overall the Port of Seattle trucks contribute only a fraction of the air pollution generated by the port. An inventory of air pollution sources at the Puget Sound ports of Tacoma and Seattle found that Seattle trucks were responsible for only about 3 percent to 4 percent of the regional air pollution attributable to the two ports, said Stephanie Jones-Stebbins, manager of environmental affairs for the seaport. However, those trucks are heavily concentrated in the Duwamish Valley. Every time a truck makes a run, it pollutes – right there in someone’s neighborhood. Port officials admit they don’t know what proportion of air pollution in the Duwamish Valley comes from the trucks. “Obviously, what comes out of that tailpipe ends up in someone’s back yard pretty quickly,” said Michael Yost, the University of Washington researcher who was lead investigator on one of the two recent studies, measuring air toxics in south Seattle for the Puget Sound Clean Air Agency. The two recent studies released in February come on top of a special federal study of the Duwamish Valley completed in 2008 that showed elevated cancer risks from airborne toxics occur across a wide swath of south Seattle from Seward Park to the western shores of West Seattle. Liana Beal, who grew up in South Park and raised her asthma-plagued son there, still sees trucks frequently passing by her family home. Air pollution researchers all know that the dirtiest air is likely to be beside the biggest highways. So it’s a little surprising that Joel Kaufman of the University of Washington, one of the nation’s leading air-pollution researchers, has his lab located right underneath Interstate 5 on near the north shore of Lake Union. However, there’s even dirtier air nearby: inside Kaufman’s lab, where scientists expose human test subjects to exhaust from a diesel engine to see what happens. “All right – the exposure will be two hours, and I think we’re squared away here,” Kaufman said as he prepared to subject a volunteer to what he estimated would be about twice as bad as standing at a bus stop. With a technician watching from the other side of a window, the human guinea pig was wired up to various special measuring instruments. The indoor diesel engine coughed to life and a maze of tubes guided the exhaust into a sealed glass room. In the course of the test, the test subject breathed in tiny globs of diesel soot. “Most people are not able to perceive common urban air pollutants when they’re present in average amounts,” Ecology’s Kadlec said. “But sometimes the amounts of these pollutants get high enough for people with normal-sensitivity to notice. Cough, sore throat, eye irritation, and greater susceptibility to then longer-lasting sinus and common cold infections are typical responses to urban air pollution. Another condition people tend not to associate with air pollution: cancer. Living with bad air significantly boosts the risk of contracting cancer, compared with living in an area with less air pollution, according to the2008 federal study. Authorities have traditionally grown concerned about anything that caused a risk of more than one cancer in a million people exposed to a substance. The biggest offender is diesel, researchers are discovering. How much of the pollution in the Duwamish Valley is related to port activities and how much comes from other sources has yet to be determined. The port certainly runs on diesel, with cargo ships, tugs, cargo moving equipment, cranes, trains and trucks all trailing that signature diesel smoke. But environmental and social-justice activists still say the first step for south Seattle to control pollution should come from the port trucks. The port in 2008 launched a voluntary effort to combat maritime-related air pollution. Offered cargo ships financial incentives to burn cleaner fuel to provide power while docked. It aims to cover half the cost of each vessel’s fuel. Cost so far: $1.4 million. About half the marine-related pollution comes from the big ocean-vessels. Provided shore-side electrical power at two of the three cruise-ship docks, so the vessels don’t have to burn the viscous, dirty “bunker fuel” while in port. Retrofitted the port’s diesel-powered cargo-handling equipment – only to be told by the U.S. Environmental Protection Agency to remove it when subsequent studies showed that the equipment wasn’t working right. Made a commitment to clean up the truck fleet by Dec. 31, 2017. Activists, though, want to see the timetable speeded up. In January the port commission approved a measure directing the staff to check out the benefits and drawbacks of a quicker cleanup. As an interim step, the port built a truck parking lot away from residential areas to reduce the number of trucks parking in nearby neighborhoods. It’s a help – but the 125 parking spots pale in comparison to the 1,800 to 2,000 trucks estimated to be carrying port goods on an average day. As of this year, the port has also banned diesel-burning trucks built before 1994, when U.S. EPA standards meant all diesel engines had to be made cleaner than before. In 2007 the EPA required another big round of pollution reduction for all diesel engines. In addition, the Seattle port spent $1.5 millionto help drivers who owned old, dirty trucks upgrade their rigs. The incentives were $5,000 or the “blue book” value of the truck, whichever was greater – yet new rigs cost $100,000 or more. In the end the effort got 276 trucks off the road, port officials said. The total number of trucks registered to do business at the port is about 8,000. The Los Angeles and Long Beach ports – the nation’s largest cargo ports – were sued by environmentalists and took a whole different approach to truck pollution. They mandated that all trucks servicing the ports must have 2007 engines or be retrofitted to be as clean as the 2007 engines. The deadline is the end of this year. In the meantime, drivers of older trucks pay each time they use the port, which discourages the use of these older trucks. Despite the activists’ and residents’ intense focus on the port trucks, port officials point out that the port at least has voluntarily begun to take a series of steps to clean up the air. Although they acknowledge no detailed studies have been done to gauge the proportion of the blame for south Seattle air pollution that can be laid at the port’s feet, they do point to one quick study that raises questions about how big the port’s role really is. In the study, University of Washington students counted the trucks crossing the South Park Bridge from 6 a.m. to 6 p.m. on a spring day in 2008. Only 50 of the trucks that crossed the bridge – less than 5 percent of the total – were of the type that typically hauls cargo out of the port. In short, port officials say, they’ve stepped up to take action while many others contributing to the problem are getting off without criticism. “We haven’t begun to scratch the surface with private vehicles,” confirms Strange. A few companies have begun taking initiative. Waste Management, for example, is converting its fleet to clean-burning natural gas. Other steps that help: Some 7,500 school buses statewide have been retrofitted so they pollute about 30 percent less. 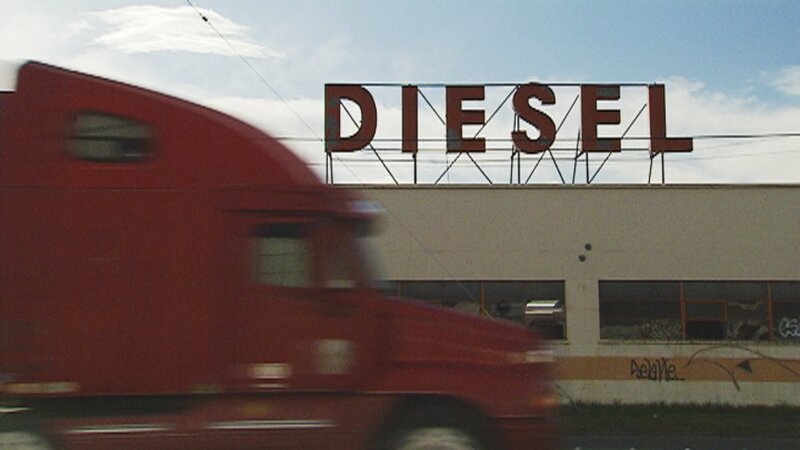 Nationally, diesel fuel got a lot cleaner under EPA standards beefed up in 2006. Even so, there are lots of dirty diesel trucks on the road. The engines can run – literally – a million miles. They stay on the road for decades in some cases. A great way to reduce the risk for residents living close to roadways is to plant bushes and trees alongside roads, said Erik Saginac of the Clean Air Agency. Vegetation about two yards wide traps 75 percent of the soot, according to a 2010 study in California. Holly Krejci of the Georgetown Neighborhood Council also suggests: Why not outlaw parking trucks within 100 feet of homes? The city could post “no truck parking” signs, she maintains. The state Health Department has also advocated for a statewide anti-idling program. Officials there and at the Ecology Department were unable to say whether it ever got off the ground. But “we have limited regulatory clout when it comes to those everyday sources,” said Gary Palciscko of the state Ecology Department. Technically, it’s the U.S. Environmental Protection Agency that has jurisdiction over the biggest problem, cars and trucks. Wayne Elson, an air pollution specialist in EPA’s Seattle offices, said the agency launched a campaign more than a decade ago to encourage voluntary retrofitting of diesel engines to make them run cleaner. While the Puget Sound Clean Air Agency has been a leader nationally in pushing the retrofits, the effort has not won over nearly enough fleet managers or individual drivers, some of whom wonder why they should do anything to their rigs if it’s not mandatory, Elson said. But the solutions go beyond EPA. The answer, says UW researcher Kaufman, is more electric vehicles and more zero-emission vehicles. And perhaps more attention to where schools and childcare facilities are located. “Evidence exists that air pollution at levels that meet current standards may still harm children’s health,” wrote the authors of the 2008 federal study on Duwamish Valley air. By their count, 168 child-care facilities and 34 schools in King County are within 500 feet of major roadways – inside the danger zone, in other words. Some states, such as California, have laws banning new construction of schools within certain distances of major roadways. Washington does not have such a law. 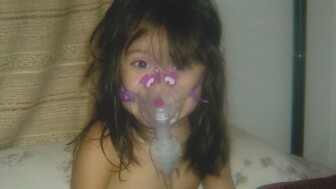 Rosa Vela just wishes the air would get clean enough to spare her daughter more debilitating asthma attacks. Her mother wonders whether they should live somewhere else. Rosa Vela doesn’t know how the family will afford a move, but there is a new urgency. Vela’s two-year-old boy is struggling to breathe now too. The Port of Seattle is organizing a public meeting Tuesday, June 28, at South Seattle Community College from 4 p.m. to 6 p.m. to discuss updating a 2005 inventory of air-pollution sources. The Port Commission has asked its staff to investigate the pros and cons of accelerating cleanup of port-related air pollution. For more information, call (206) 787-3000. This story is the product of a collaboration between InvestigateWest, an independent nonprofit newsroom covering the Pacific Northwest, and public broadcasting station KCTS Channel 9. Please consider a donation to support this kind of in-depth reporting. Seattle has gained a national reputation as a haven for “foodies” – but there’s a “food desert” in its own back yard, ironically in an area that once helped feed a growing city.The area near the banks of the Duwamish River south of Seattle is where the founder of the Pike Place Market had his original farm. Today, some yards in that area are so contaminated with dioxins in the dirt, the health department advises residents not to grow their own gardens. It’s a place where waves of tribes and immigrants continue to fish the river as they have for decades, but where PCB’s in the river bed have made resident fish no longer safe to eat.After a century of industrial use, the lower Duwamish River now runs through one of the largest urban Superfund sites in the country. A recent examination of public health data by InvestigateWest revealed that residents who live in the vicinity face more chronic health problems than people who live in other parts of the county. Data show residents in the Duwamish communities are typically more overweight, and have higher incidence of diabetes and more deaths from heart disease. Life expectancy in the area is five years lower than for other, more affluent parts of King County, likely because of some combination of poverty, pollution, and lifestyle.And food lies at the intersection of all those problems. Affordable nutrition– or lack of it – is at the heart of many of the health problems facing residents in the region along the Duwamish.